The positive action, easy access, maywheel not only allows you to dial up the required lens quickly, but also gives you total control of where you are in the lens range making each exam quicker and easier. The extensive range of +29D to –30D in single dioptre steps ensures easy examination of all ocular structures and covers a wide range of patient/user prescriptions. A quick step swing of +/- 20D helps speed up diagnosis. 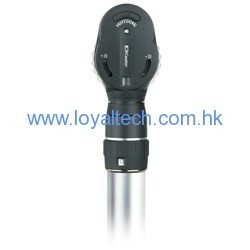 The Professional also uses Xenon illumination for a brighter and whiter long lasting light. Giving you more power and fewer bulb changes.